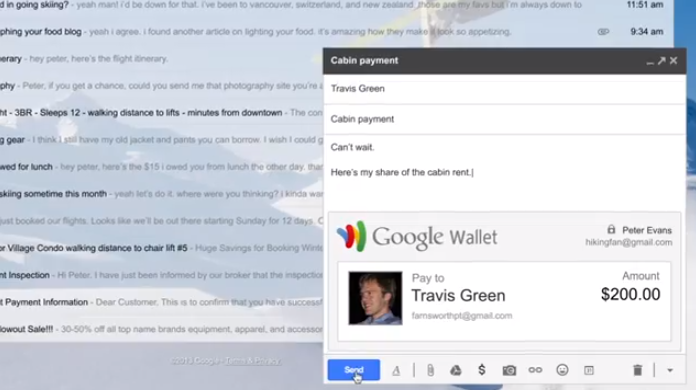 Google I/O: Google introduce new options to send money from Google Wallet via Gmail! Google's Wallet platform is a good idea and it's popular in some circles, but for whatever reason it isn't really something a lot of people use all of the time. That doesn't mean that Google are resting on their laurels in the finance department though and instead they're busy adding the ability to send money from Google Wallet through your Gmail account! The way this will work is that there will be a little $ sign next to the attach file paper clip and if you hit that $ sign then you can add money to the email, assuming the other person has a Google Wallet account too! Apparently if you have a credit or debit card attached to your account and there are transaction fees then Gmail will warn you about those before you hit the send button! This feature will roll out over the coming months to people in the US assuming you're aged 18 or over and you won't be allowed to do this from mobiles. You can however, do it through the Google Wallet mobile site and it's likely that the feature will come to mobile Gmail when it's possible to overcome the obvious security issues!